Adrienne shall be the guinea pig, and I shall be the one to translate her post-partum pad adventures into delightful blog posts! In order to raise awareness about the existence of washable post-partum pads, I’d like to not only review a variety, but also hold a #PostPartumPadParty Promotion, where entrants get the chance to win a post-partum pad of their own! 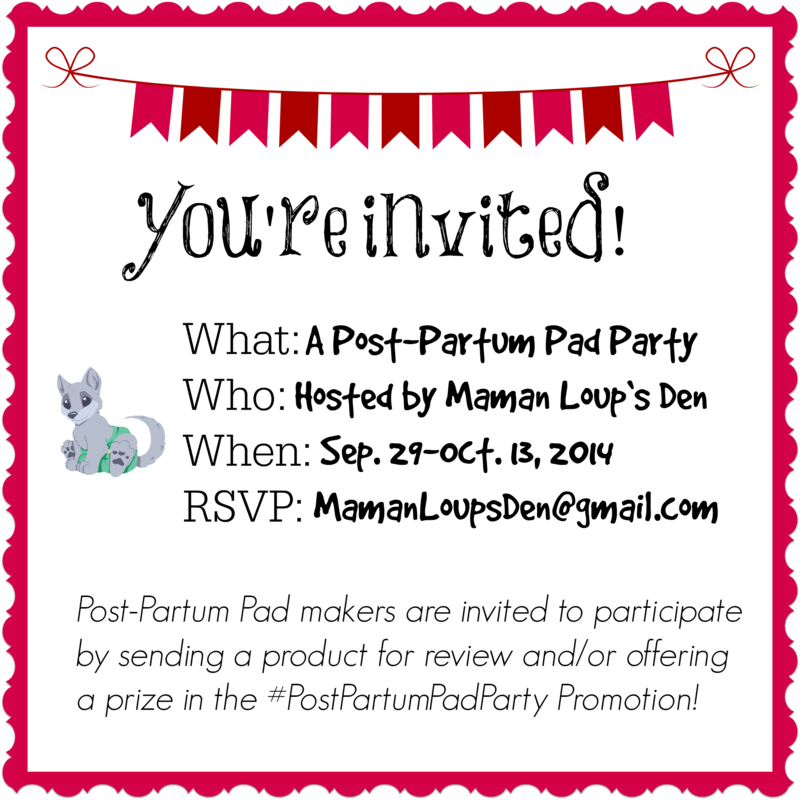 If you are a maker or retailer of post-partum pads, you can participate by submitting a pad free for review and/or by agreeing to sponsor a prize in the giveaway. Prizes are to be shipped at your expense within 2 weeks of draw closing, and the giveaway will be open to Canada and the US. I promise to bring your brand or shop plenty of exposure via promotion in my various social media channels, and will be recruiting other green-minded bloggers to help promote the giveaway. I will be continuously updating a Facebook album with all Post Partum Pads to be tested, another great way to get exposure for your products! You can check it out here. If you would like to participate, please contact me @ MamanLoupsDen(at)GMAIL(dot)com and I’ll send you all the necessary details. If you are a blogger and you are interested in helping promote the #PostPartumPadParty at the end of September, please fill out this form! I would love to sign up. Just waiting to see if Pink Lemonade Shop signs up. (I am a PLS brand ambassador and cannot participate unless PLS signs up.) Sounds like an amazing event! PL said my numbers aren’t within their usual minimum. So maybe if you’re on board promoting, they’ll get on board, lol!